Power through workouts and weather with Saucony running tops for women. Browse high-performance women’s running tops to find what you need to train in any conditions. Our collection of short-sleeve, long-sleeve and sleeveless running shirts for women features ultralight, breathable fabrics, as well as anti-microbial, moisture-wicking and compression technologies. 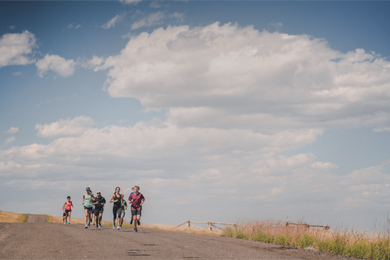 Whether you’re running fartleks on the track or getting in some off-road training on your favorite trail, our singlets, t-shirts and hoodies will keep you comfortable so you can focus on the run. Plus, stay visible on sunset runs when you order running shirts for women with reflective technology, or browse our women’s outerwear collection for packable, water-resistant jackets to sprint through spring showers. Shop the entire collection of Saucony running tops for women to find premium apparel that keeps pace with our women’s running shoes.